Why the QuickStart format of play for children 10-and-under who have already been playing tennis for years, teaching pros are asking? The short video below demonstrates the advantages of QuickStart in helping small children properly develop their tennis games in a size-appropriate setting, rather than being pushed around an oversized court with an oversized racquet and ball, constantly struggling through high-bouncing, awkward shots that do little to develop their games. Jorge Capestany, founder of TennisDrills.tv, offers a revealing video comparing the QuickStart format to full court tennis training for young players. Capestany is one of only nine tennis professionals worldwide that is a Master Professional with both the USPTA and PTR. 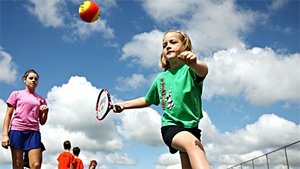 QuickStart Tennis is a new play format that has been developed to help kids 10 and under play the game of tennis. To make the game more accessible to children, several elements have been modified, including the court size, the racquet size, the balls, the scoring system and even the net height. The MaliVai Washington Kids Foundation center in Jacksonville features three permanent QuickStart courts, and the Roger Scott Tennis Center in Pensacola is undergoing a renovation that will include permanent QuickStart courts for kids 10 and under. The USTA and Newark, N.J., Mayor Corey Booker also recently announced the reopening of a renovated Jesse Allen Park, the first public park in the nation to feature tennis courts of three sizes: full-size courts (78'), and permanent 36' and 60' QuickStart courts.